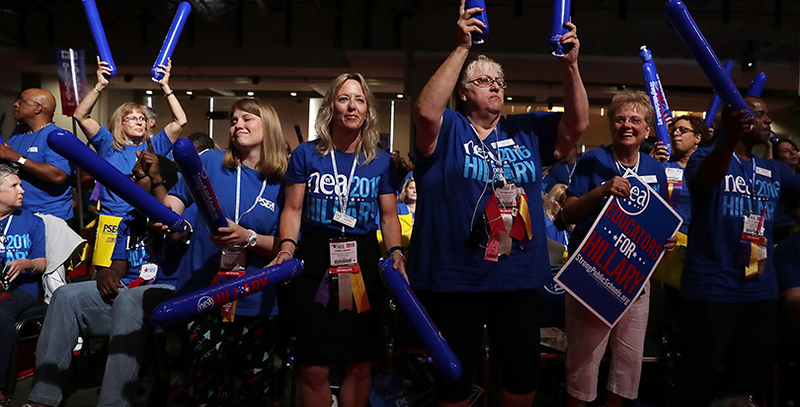 Hillary Clinton preached to a choir of thousands at the National Education Association’s annual convention Tuesday — the enthusiasm broken only by Clinton’s brief endorsement of charter schools, a heresy among teacher unions. The likely Democratic presidential nominee endorsed several of the union’s priorities, including more affordable childcare options and universal preschool, higher pay for teachers and support professionals, repairing America’s crumbling school buildings, and the ability of teachers to refinance their student loans and participate in programs that forgive them. That support flipped abruptly, however, when Clinton argued that the country needed to identify successful schools and replicate broadly what makes them work. 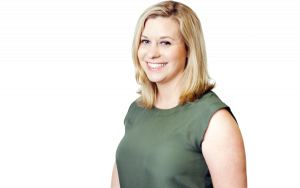 “When schools get it right, whether they’re traditional public schools or public charter schools, let’s figure out what’s working and share it with schools across America,” she said, as the audience of educators interrupted her with boos. Clinton quickly pivoted, putting the focus on an even more widely reviled educational boogeyman, for-profit schools. “We’ve got no time for all these education wars, where people from the outside try to foist for-profit schools on our kids. We will never stand for that. That is not acceptable,” she said. Charter schools are perhaps the most potent symbol of the split among Democrats on national education policy. Unions, longtime party stalwarts, generally oppose them, largely because most states don’t require charter school teachers to belong to unions. Other Democrats, including those associated with the “reform” movement, back the schools as a way to provide new, innovative education options for children of color and those in poverty. All of Clinton’s comments reflect the latest draft of the Democrats’ national platform, released July 1, which supports charters as part of a larger commitment to provide high-quality public schools. Charters have been something of a thorn in Clinton’s campaign since late last year. In the fall, she told journalist Roland Martin that charters don’t take the “hardest-to-teach” students or, if they do, don’t retain them the way public schools are required to. The comments were widely criticized, and her campaign had to quickly clarify her position. Clinton’s speech was not dissimilar to then-Sen. Barack Obama’s in 2008 before the same audience. Obama also attacked union bugaboos like “teaching to the test” and vouchers — but he also surfaced a point of disagreement, arguing for teacher merit pay (which he acknowledged was likely to be unpopular). Video of the event shows the crowd at the convention booing the future president even though he addressed the conference via video feed. Clinton concluded her speech bashing her likely Republican opponent, Donald Trump, whose education policy ideas largely remain a mystery. Trump wants to largely eliminate the Education Department, which provides vital services for poor children, those with disabilities and English language learners, Clinton charged. His combative public speeches have led to a rise in bullying and a fear among minority children, she added. “Just like Trump shouldn’t have his finger on the button or his hands on the economy, he shouldn’t have anything to do with our children’s education and our public schools,” she said.